The deceased, Meenakshi, was married to a cab driver, Harish (27). BENGALURU: A few days after her husband was hacked to death over suspected honour killing, a 24-year woman hanged herself to death at her house in Bidarahalli in Vishwanathapura near Devanahalli on Thursday morning. The deceased, Meenakshi, was married to a cab driver, Harish (27). 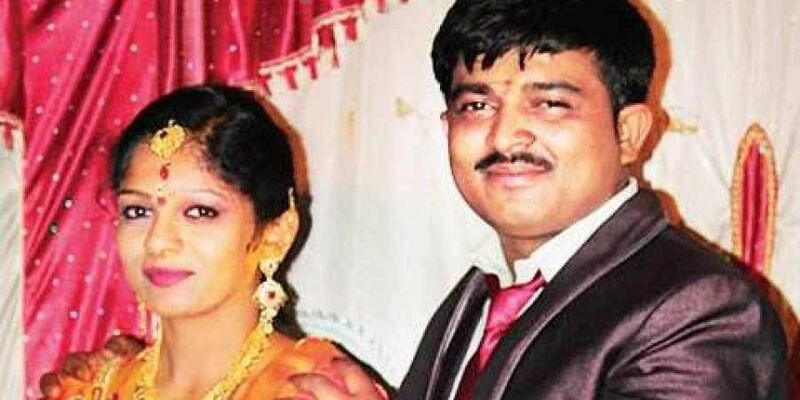 She was depressed after Harish was allegedly killed by her brother, who was against their inter-caste marriage, last month.A senior police officer said Harish was found murdered at Nallur in Channarayanpatna police station limits on November 20. Meenakshi's brother Vinay Kumar (22) was arrested the same day for hatching the plot since he was bothered about his family’s reputation. Meenakshi was extremely upset over Harish’s death and refused to talk to her parents when they came to meet her after a week. She was living with her in-laws. On Thursday, she was alone at home when her father in-law, Muni Anjanappa, who works as a waterman, went on duty. He returned at around 8.30am and found her room locked from inside. He called Meenakshi to fetch water. When he got no response from her, he broke open the door and found her hanging. She was rushed to a private hospital where she was declared brought dead. “Meenakshi left a suicide note, stating that she herself is responsible for her death. She added that no one should marry against their parents' wish. She asked her parents to attend her final rites,” the police officer said. Meenakshi’s aunt Chandrakala told TNIE that the two talked on phone on Wednesday evening. "She asked me about her uncle, Rajashekar. She told her in-laws that she cannot live without her husband. She was also upset as her relatives did not go to meet her after Harish's death. I denied it as I wanted her to come out of the shock. I never thought she would end her life,” Chandrakala said. Anjanappa said it was thought that she was pregnant. “We took her to a private hospital on Wednesday morning, where the doctor conducted a checkup and ruled out pregnancy. Later, she refused to have dinner, even though biryani was prepared, which she used to like a lot,” he added.